As you guys may have figured out, I have a new-found penchant for Indian cuisine - not that I didn't like it previously (I tended to always eat the same things - mostly the "butter chicken" with rice, a piece or two of tandoori and maybe a little of the vegetarian chic pea dish, etc. ), but after experiencing many varieties in India for several weeks earlier this year, the bug has certainly hit me again. It's been nearly 20 years since I've eaten at this venerable institution - as I recall from long ago, I thought the food was "OK" and have since dismissed it from my mind - funny, as I'm frequently in the area and it's not a bad drive from my office near Perimeter Mall. 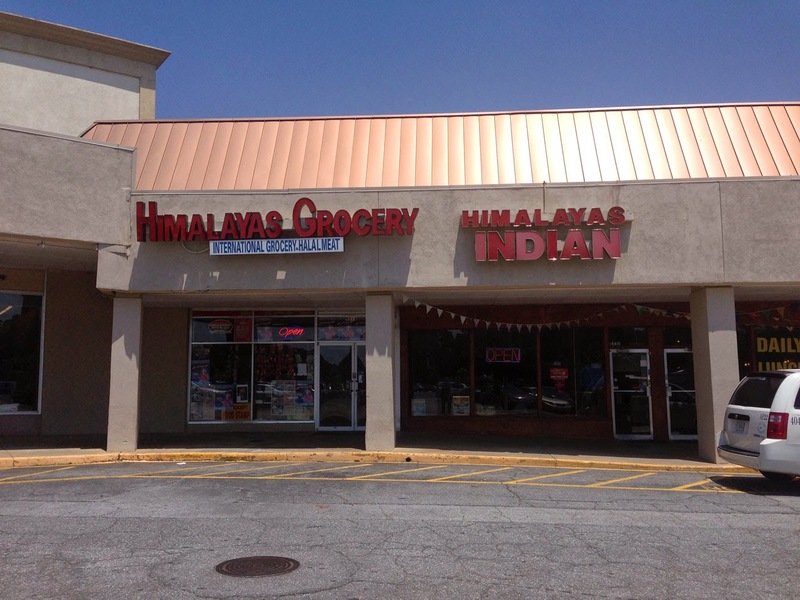 From the parking lot, Himalayas doesn't look like much - there's also a sister store "Himalayas Grocery" to the left. The restaurant was once in a bustling shopping center that has since seen a decline - I've heard that it's due for a sprucing up and will be the location of a new anchor store. Right now, besides Himalayas there's a Chik-fil-a, an IHOP and a Duncan Donuts/Baskin-Robbins facing Peachtree Industrial, so it's a bit of a fast-food alley. We were enticed to once again visit due to a Groupon - two buffets including a samosa and mango lassi, for the price of one. It seemed like a good deal and I'm glad it once again brought us to this good Indian restaurant. The interior of the restaurant is more high-end than you would expect from such an innocuous storefront - tables line the walls and middle, covered with real cloth table covers and cloth napkins. The service here is quite good, although at first brush you may be taken aback by the droll attitude of the servers - they're actually quite funny in a cynical way and know they're way around food. 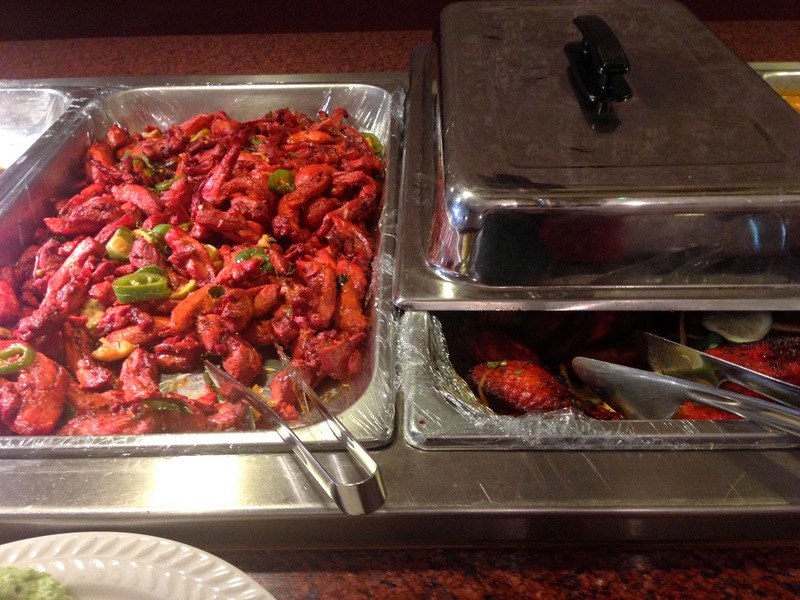 Himalayas focuses more on the cuisine of Northern India (some call it Delhi style) featuring many tandoori-cooked items and kabobs. We arrived around 11:30 and were seated immediately, heading for the buffet. 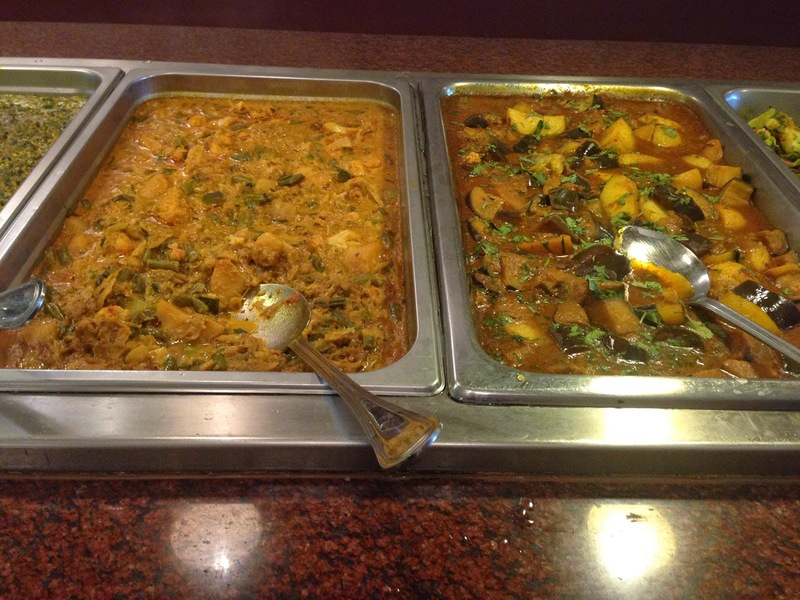 The buffet is towards the back of the restaurant and consists of two lines - a non-veg line on the left and a vegetarian line on the right. I liked that they kept these distinctly separate as some of my vegan friends get pretty weird about the food "accidentally touching" when it's all in the same place. Towards the back is a cold line with many chutney and pickle options - also some great looking fresh fruit, salad and desserts. 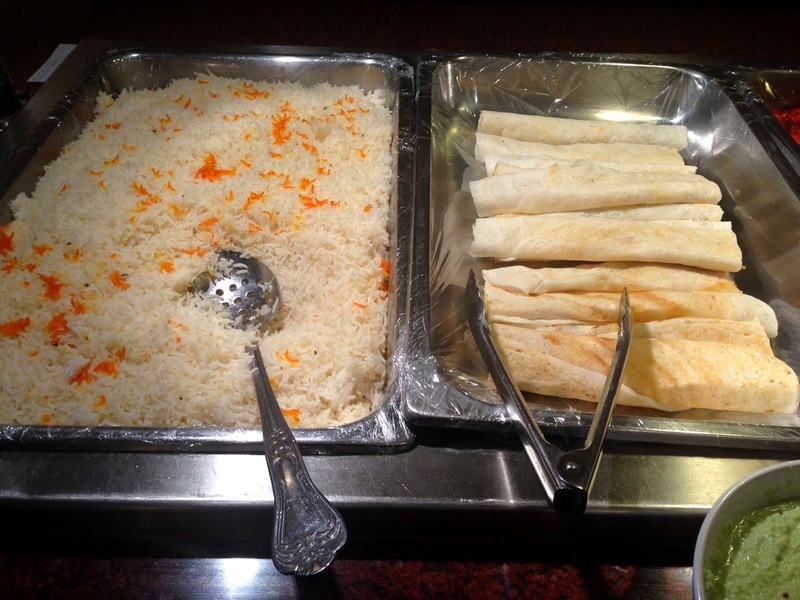 The first two hotel-pans you see on the meat-line were of a nice long-grain basmati rice and something you rarely see - dosas! The dosa is a thin crepe (traditionally they're bigger than these and in India served on a banana leaf but I think this is a much more manageable style for individual servings on a buffet) - these are time consuming to make and I was surprised to see them on a buffet. These are Madras style served with a delicious mint chutney. Next were two chicken dishes, first something called "Chicken 65" which appeared to be white meat chicken marinated in tandoori marinade (spiced curd) heated and tossed with jalepeno peppers - loved this stuff. Next door were traditional tandoori chicken wings that were very good - first time I've seen a whole pan of chicken wings done this way and I must say it's a winner. Next we get into the ubiquitous chicken tikka masala - most of my friends call this "butter chicken" and after eating three different variations of "butter chicken" while in India, I guess that's as good as any other name. This is a rich, tomato-y curry dish that even people that don't like Indian usually enjoy. This version was a bit milder than I like but still delicious and creamy. 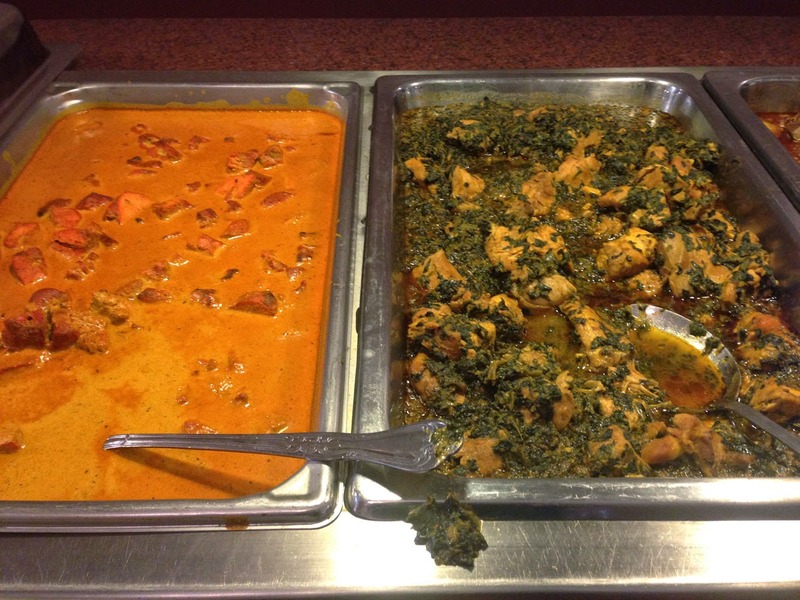 Next to it was something I haven't had before, sag chicken - pieces of chicken cooked with spinach, very tasty. The final pan held the goat curry which was appropriately spicy and tender. Across the aisle, the vegetarian options started with curried vegetables that had a nice combination of green beans, peas, potato, carrot, zucchini squash and eggplant. 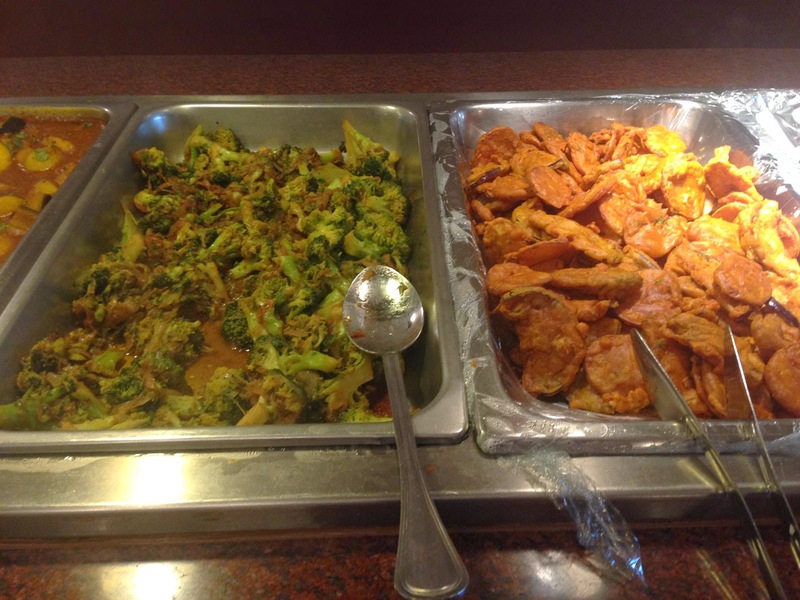 It had much more variety than what you usually see at your typical buffet and a decent amount of spice. To the right a very nice sag paneer with fresh sliced tomatoes - this was one of my favorites on the line - being saucy enough that it didn't get that "hammered" over-cooked flavor. 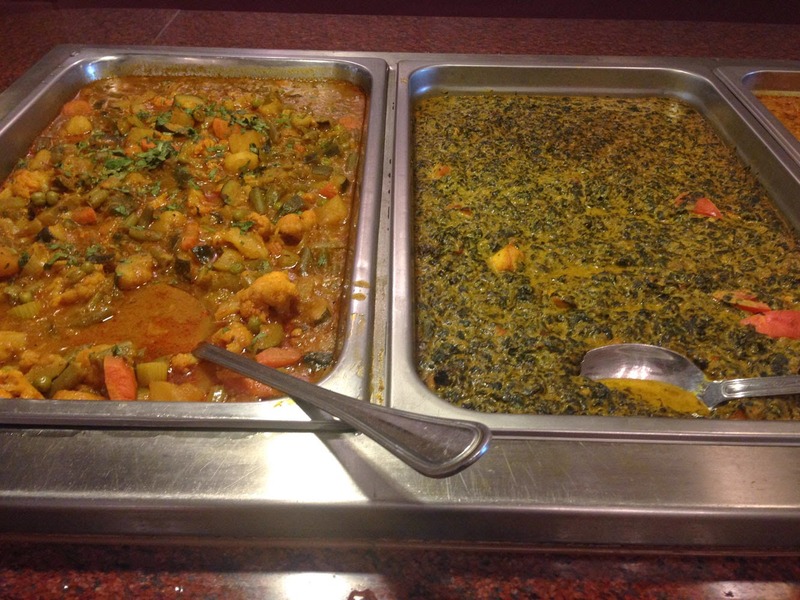 There was then a tofu masala that was also very tasty next to curried eggplant that was delicious and finally a very nice pan of spiced broccoli and very fresh pakora (this latter also had eggplant in it - something I don't usually see). 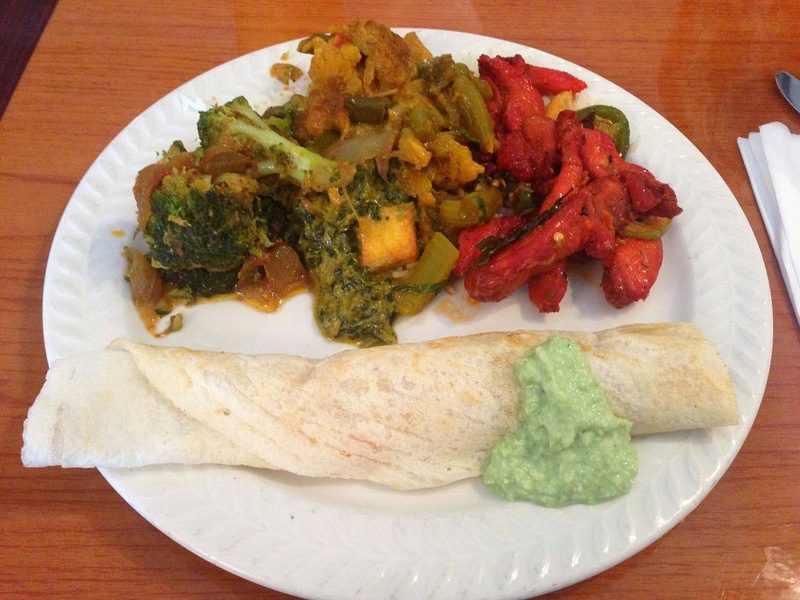 I filled up a plate and headed back to the table - all was delicious and I especially liked the dosa. In the meanwhile our server showed up with a piping-hot samosa that was delicious - the shell was more like a filo pastry shell than what you normally find. We were also given mango lassis which really hit the spot. I went back for about half a second plate, picking up some items I hadn't on the first pass, then hit the cold line for some dessert. I especially liked the kheer - at first I was a bit suspicious as it had more of a yellowish tint than I've seen and this usually means it's had some spice like cinnamon added to it (hate that), but this kheer was right on. I asked one of the servers and he indicated that the color was from the slow cooking of the milk and the almonds/pistachios added - the kheer was awesome! In all I left extremely full and very happy. 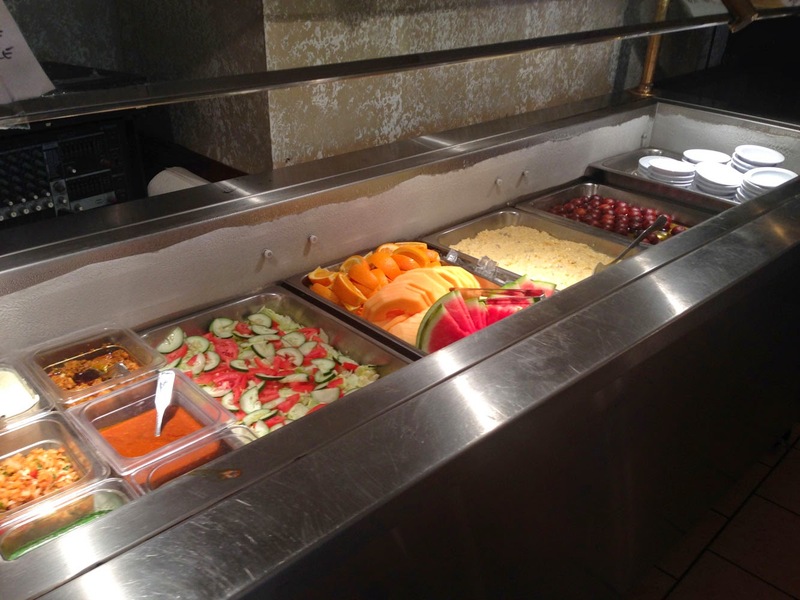 I'll definitely be returning to this great buffet!